By way of a recap for anyone that missed it, some weeks back Brewdog released a beer called "Nanny State". Think IPA, super hoppy, super bitter and you're not too far off. The only difference being the ABV. Where you might be expecting an alcohol content anywhere up to 6 or 7 percent, this little number only weighs in at 1.1 percent. Many beer writers, better than I, have written about the reasons behind the production of this beer and the events that lead to its creation. 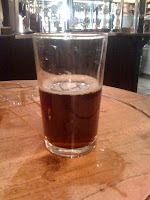 However, what interested me personally, as a home brewer, was a unique chance to a taste a "proper" beer with one of the key components missing. That component, of course, being malt and therefore alcohol. By tasting something like this you can better understand the role each component part plays in a finished beer, meaning you can better adjust that part in future beers you make. Hopefully allowing you to get both a better end result and an end result closer to that which you were aiming for. Of course, adjusting ingredients from one beer you make to the next will allow you to achieve the same result. The only problems with this being that you aren't brewing to commercial standards, so cant be sure 100% of the impact on taste that your processes are having without you being aware of it. Secondly, beer ingredients aren't cheap, and home brewing a batch of beer from grain to glass takes a significant amount of time. Money for ingredients and six weeks of maturation time is a lot to spend on an experiment, that could end up being poured down the drain. I was lucky enough to hear that The Rake had a limited amount on hand pull, so I popped in after work to check it out. As you'd expect, the nose is all hops with no sign of maltiness at all. Despite this, the aroma does go some way to hiding the beer's secret. As soon as you taste however, it's immediately obvious that something's up. It isn't the alcohol void that's the problem, it's the complete lack of body and any sweetness at all. What you get is a thin, insipid, watery drink that finishes with insane levels of hop bitterness. The bitterness of the finish is so much in fact, that you're left not wanting another sip. Imagine putting a tea bag in boiling water and coming back to drink it the next day, that's what this beer is like. Point proven then, I guess. If you're going to make a super hoppy beer with bucket loads of complex hop flavour, you need the malty sweetness (and consequently the ABV), to balance it all out and make it drinkable. Whilst I do agree with this and understand the reasoning behind Nanny State, I don't think it's beyond the talents of Brewdog to produce a super hoppy 3.5-4% "IPA", that tastes great and you can easily drink several pints of. Infact, I don't think it's completely beyond my talents as a home brewer, at least to get pretty close. Great post. I think Nanny State is virtually undrinkable. I like that they've made a 1.1% beer but why the hell would they throw a ridiculous number of hops in it?! I would have a lot of respect for them if they made a 2% beer that is very drinkable. Their Edge is a great example of low alcohol beer with great flavour. Have you had How to Disappear Completely? That's a super hoppy 3.5% Brewdog. The reason that American IPAs taste so good is because they use a lot of hops but the sweetness (often a lot of sweetness!) is there from the higher ABV. Balance is an important word... drinkability is even more important! Sadly, I didn't get to try either Edge or How to disappear completely. There does seem to be a void of that type of beer and, in all seriousness, I think it is something I'll test my homebrewing skills against in the new year. A keg of 2-3% super hoppy beer sounds like the perfect thing to drink in the hot summer months after work. I agree. I'd love a great 2% beer that you can have a few pints of without getting smashed. I'm all for 9% hop monsters but you can't sit down and drink 4 pints of them! When I give it a shot in the new year, I might send you a bottle. Never had a chance to try this one, and your description sounds exactly what I thought it might taste like. Alcohol, malt and sweetness are vital part of beer flavour. I even think it is hard to produce a hoppy beer under 4%. I love a well made mild around the 3% level though. Totally agree. Milds are one of my favourite styles. I know CAMRA has a mild month, but I don't think we see enough of them. If you live near or in London, there are a couple of places you can still get Nanny State. For me beer is all about balance, you need the malt and the hops to play off each other in an bitter/sweet/rich way. How To Disappear and Nanny Stae did neither for me. Nanny State (frustrating overblown reasons for its creation aside) was nothing but a wastt of good hops. There is no reason why there can't be a 3/3.5% beer with sweetness and bitterness in the correct balanced manner. I'll try and brew some in the new year. Thanks for the comment Pete. Interesting that you didn't like how to disappear. I'm really in the mood for this type of beer now. Good luck with brewing an attempt in the new year, perhaps we could swap bottles.